Ron and Patti Chappel purchased their 15 acre vineyard in 1987 as an investment. The vineyard had originally been planted in 1972 by Fred and Mary Benoit (See Chateau Benoit). The first Secret House wine was released in 1991. They produced 3 highly regarded sparkling wines called “Northern Silk”, “Red Silk”, and “Celebration”. Their stated mission was to “produce high quality wines at reasonable prices”. “We are in the business to stay in business” said Patti. Secret House became the premier outdoor music venue in Lane County hosting a Summer Concert Series, and the International Faerieworlds Festival. 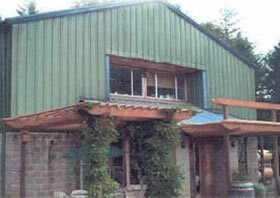 The winery was located at 88324 Vineyard Lane, Veneta, OR 97487. Secret House was sold in 2011 to Domaine Meriwether.